Believing is Seeing: The Role of Physics Expertise in Perception. "Is prospective memory unique? 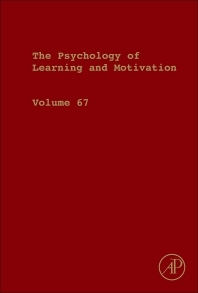 A comparison of prospective and retrospective memory"
Psychology of Learning and Motivation, Volume 67 features empirical and theoretical contributions in cognitive and experimental psychology, ranging from classical and instrumental conditioning, to complex learning and problem-solving. New to this volume are chapters on a variety of topics, including Domain-general and domain-specific contributions to working memory, Believing is Seeing: The Role of Physics Expertise in Perception, Preferences in Reasoning, Post retrieval processing: How knowledge is updated after retrieval, Morpho-orthographic segmentation and reading: the role of embedded words, and "Is prospective memory unique? A comparison of prospective and retrospective memory." Each chapter in this series thoughtfully integrates the writings of leading contributors, who both present and discuss significant bodies of research relevant to their discipline.